It has been a very long time since I shared this space with you. Please accept my apologies for the long absence. It was needful for me to take some time off to focus on the long-drawn out assignment of finishing my Book; Grace In The Storm. The journey has been long and tortuous, just like the story behind the Book. Both the story behind the Book and the writing of the Book are testimonials of God amazing grace and faithfulness. 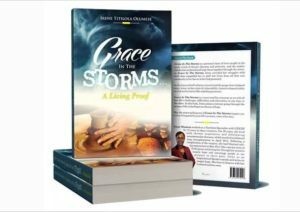 So, it with great pleasure and deep gratitude to God that I announce to you that Grace In The Storm – A Living Proof is now published. The Book is selling via several outlets in Nigeria and Switzerland. It is available on Amazon in Paperback and Kindle edition. There will be a 3-day promotion of the Kindle Edition of the Grace In The Storms on Amazon from April 9th to 11th, 2017. During this period, you will be able to get the Kindle Edition at a reduced price. The writing of Grace In The Storms took thirteen years. For several years, I didn’t even know how to present the story or how to end it. I wanted to the story to speak of the victory that God brings to bear in the lives of His people. I wanted the story to present a testimony that requires no explanation. I wanted those who knew me in the years of the storms to see a change that will cause them to acknowledge the goodness and faithfulness of God in my life; “they were amazed and astonished at the greatness of God.” And all the people who see me will give praise to God and glorify His name. God brought that change about in 2013 with yet another twist to it. That twist resulted in the establishment of the Feet of Grace Foundation. My word of encouragement to you today is this; persevere in hope until you see the desires of your heart manifested. Don’t give up on hope. Don’t give yourself the permission to quit when the journey becomes tough and is full of twists, turns and bends. Stay focused on the goal. Be relentless in the pursuit of your dream and heart desire. I don’t know how long it will take but I can assure you that if this is in line with the will of God for you, He will bring it to pass, come what may, in His own way and in His own time. The Foundation is touching lives for good and making a difference in lives today simply because unflinching support of the friends of Feet of Grace Foundation like you. With your support, the Foundation has provided prosthetic limbs and wheelchairs for 10 amputees. 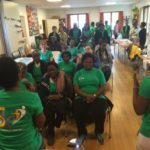 Two of the women received support to leverage poverty alleviation. Two of the boys are back in school with the educational scholarship provided by Rehoboth Dream Support Foundation. Together, we are making a difference one amputee at a time. We are set to do it again. 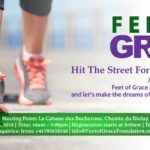 The 3rd Annual Feet of Grace Foundation Charity Walk: Hit The Street For Their Feet 2017 will hold on Saturday, April 29th, 2017. You can join us in your cities to Walk so that Amputees can walk again. You can organize your friends to walk 5-10km (whatever is possible for you) with you in your city. Then you invite more friends to support your walk. The funds raised will be used to support the amputees selected for 2017. T-shirts, bracelets and flyers will be made available to you. The T-shirts are for sale to aid in the fundraising. Please contact me if you want to organize the walk in your city before March 15th, 2017 and let us know how many T-shirts you will need. This will help us in the overall organization of the Event. Our goal is to provide support for at least 10 amputees in 2017. For this purpose we aim to raise N15 million ($30,000.00). May God’s grace continue to abound to you in increasing measures in Jesus name.